This step-by-step tutorial shows you how to create a rain effect in Photoshop that can easily be addded to any photo. Works with any version of Photoshop. For all skill levels. Most of us would prefer to avoid being caught in the rain if possible, especially if we have our cameras with us. But what if you're one of a large number of people who enjoy taking photos of weather? Even if weather photography isn't your main interest, there's no denying that rain adds a whole new dimension to your images. 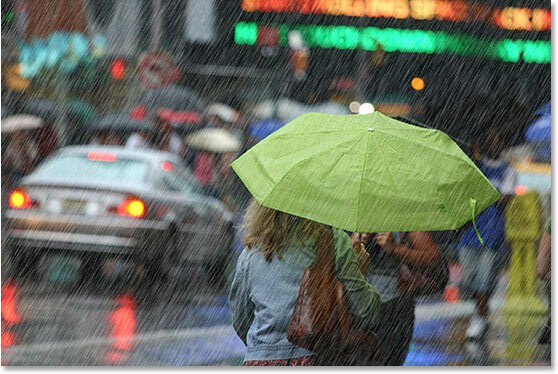 So how do you capture photos of rain without getting your camera all wet? Easy! Wait till it stops raining, take the picture, then add the rain back in using Photoshop, which is exactly what we're going to learn how to do. This version of the tutorial is for Photoshop CS5 and earlier. 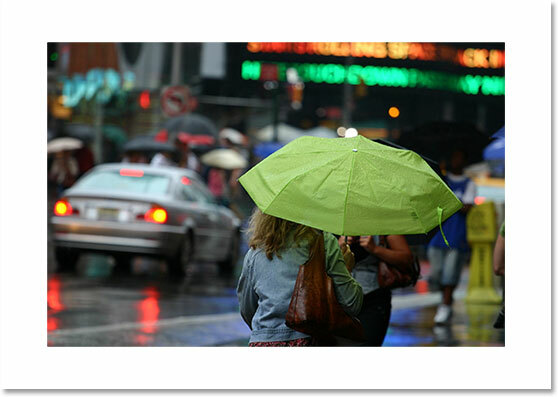 Photoshop CC and CS6 users will want to check out our fully updated Photoshop Rain Effect tutorial. And here's the same image after adding the rain in Photoshop. It's really coming down out there! The Layers palette in Photoshop showing us the original image on the Background layer. Duplicate the Background layer by pressing "Ctrl+J" (Win) / "Command+J" (Mac). Reset the Foreground and Background colors. Then, with the Crop Tool selected, click and drag a selection around the entire image. If you're working with your image displaying inside a document window, press F on your keyboard to switch Photoshop to Full Screen Mode With Menu Bar, which will make things easier. Then just click outside the top left corner of the image and drag down below the bottom right corner. Drag the handles to add more canvas space around the image. Photoshop fills the extra space with the current Background color. Click on the "New Layer" icon to add a new blank layer. The new blank layer at the top of the Layers palette. We're going to fill the new layer with black. Since black is currently our Foreground color, we can use the easy keyboard shortcut Alt+Backspace (Win) / Option+Delete (Mac), which tells Photoshop to fill the layer with our Foreground color. The image will now appear filled with solid black, temporarily hiding our photo from view. Add noise to the black-filled layer. Click OK when you're done to apply the noise to the image and exit out of the dialog box. Apply the Gaussian Blur filter to the noise. Hold down "Alt" (Win) / "Option" (Mac) and click on the "New Adjustment Layer" icon. Photoshop's "New Layer" dialog box. 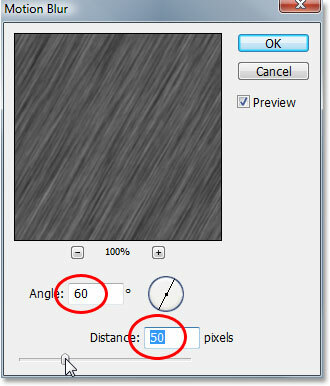 Click OK in the top right corner to exit out of the dialog box, and Photoshop adds the Levels adjustment layer for us. It also brings up the Levels dialog box, which we'll look at next. We're going to use Levels to both reduce the amount of noise we have and to boost the contrast in the noise that's left over. With the Levels dialog box open, you'll see a large graph in the top half. This is called a Histogram. We don't need to get into details about it here, but directly below the histogram, you'll see three sliders - a black one on the left, a white one on the right, and a gray one in the middle. Click on the black one on the left and begin dragging it towards the right. Remove noise with the black slider on the left and increase the contrast with the slider on the right. Reduce the amount of noise in the image with the black slider, and increase contrast in the noise with the white slider. Click OK in the top right of the Levels dialog box when you're done to exit out of it. Select the noise layer in the Layers palette. 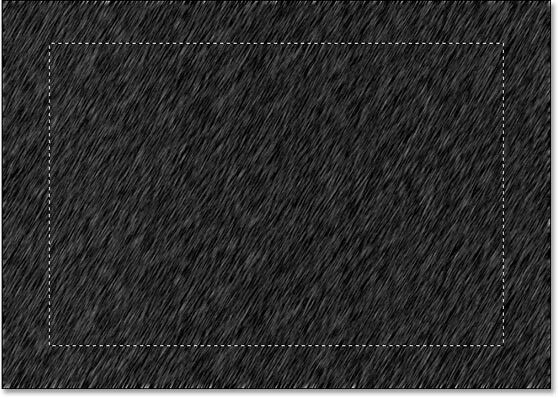 Set the direction the rain will fall in the "Angle" option, then set the "Distance" to around 50 pixels. Bring back the Levels dialog box by double-clicking on its thumbnail in the Layers palette. 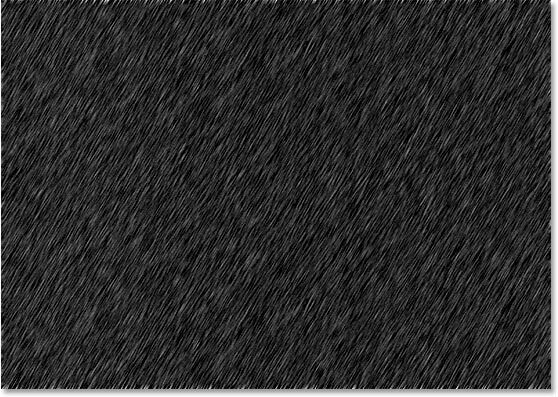 Drag both the black and white sliders more towards the left to bring the noise back into view in the image. The motion blurred noise is now visible in the image. If you look closely along the top and bottom edges of the image, you'll see that things look a little strange, and that's because of the problem I mentioned at the beginning of the tutorial with the Motion Blur filter having trouble around edges. No worries though because we added extra space around the edges, so none of that problem area is going to affect our photo. In fact, we'll be cropping it away in the very next step. "Right-click" (Win) / "Control-click" (Mac) on Layer 1's thumbnail in the Layers palette. A selection appears inside the document. All we need to now is go up to the Image menu at the top of the screen and select Crop. Photoshop will crop the image around the selection, removing the extra canvas space and bringing our image back to the size it was when we started. Once you've cropped the image, press Ctrl+D (Win) / Command+D (Mac) to remove the selection from the screen. 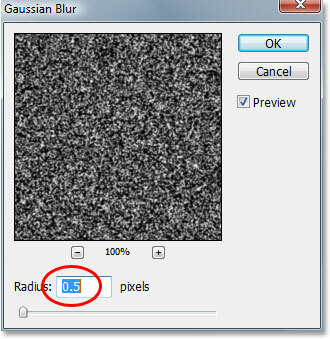 Step 12: Change The Blend Mode Of The Noise Layer To "Screen"
Change the blend mode of the noise layer from "Normal" to "Screen". As soon as you change the blend mode, the original photo becomes visible in the document and our motion-blurred noise becomes the rain! If you want to fine-tune the rain effect, simply double-click once again on the Levels adjustment layer's thumbnail in the Layers palette to bring back the Levels dialog box and re-adjust the black and white sliders until you're happy with the rain effect. Click OK when you're done to exit out of it. 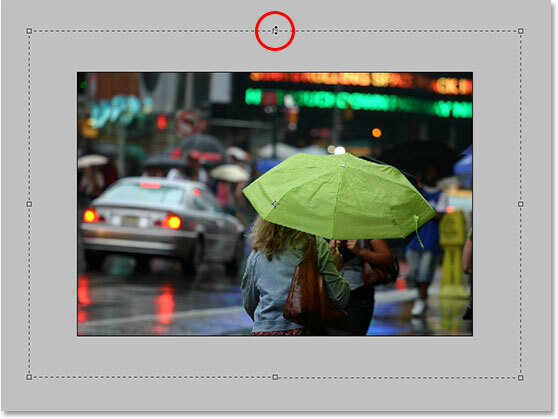 And that's how to add rain to a photo in Photoshop and avoid damaging your camera! Visit our Photo Effects section for more Photoshop effects tutorials!